Today in Masonic History Allan Henry Shafto Adair passes away in 1988. Allan Henry Shafto Adair was a British soldier. Adair was born in London, England on November 3rd, 1897. He attended the Harrow School from 1912 to 1916. In May of 1916, Adair joined the British Army and received a probationary commission as a 2nd lieutenant. In December of that same year he was sent with his unit to the Western Front in France and Belgium. There he was promoted to the rank of lieutenant. On December 2nd, 1918, Adair received the first of two Military Cross medals. This medal was received, according to the citation, for his efforts on the battlefield when the lead company became lost in fog, Adair led his company to the correct position for the engagement. He also made several personal reconnaissance patrols while under heavy machine gun and rifle fire. He then captured his objective without the assistance of tanks or artillery. The following day he was able to break up a counter attack. Adair's second Military Cross was received just 4 months later in April of 1919. This was for his efforts on November 4th, 1918 in Preux-au-Sart which is on the France and Germany border. It was there that he led his unit in taking an enemy line with minimal casualties. Wounded himself in the battle, he remained in command until the following day when he was properly relieved. In the years between World War I and World War II, Adair moved up the ranks to become a Major in the British Army. After the start of World War II, he was promoted to acting lieutenant colonel and was put in command of the 3rd Battalion which served during the battles of Belgium and France. They also held the perimeter under German fire during the Dunkirk evacuation. From September of 1942 until December of 1945, Adair was the General Commanding Officer of the Guards Armored Division. It was during this command that he was promoted to the rank of colonel. The Guards served during Operation Overlord, also known as the Battle of Normandy. His division liberated Brussels. After the German surrender in 1945, his division remained as part of the occupying force and were converted to an Infantry unit. 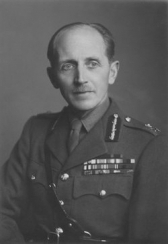 Adair was promoted to major-general while serving in Greece between 1945 and 1946 during the Greek Civil War. He retired from the military on March 11th, 1947. He remained though in the Regular Army Reserve of Officers until his birthday in 1957 when he reached the mandatory retirement age. Adair passed away on August 4th, 1988. Adair was a member of the United Grand Lodge of England and served as the Deputy Grand Master from 1969 to 1976.